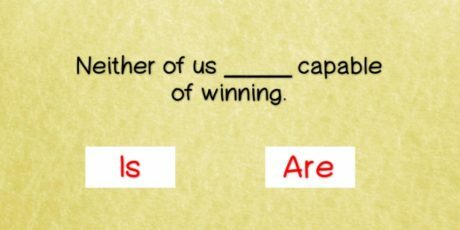 One of the most rudimentary rules of grammar is matching the right verb with its subject. But it seems to be so convoluted and complex due to the sheer number of choices one has to consider: TWO… either singular or plural. Filipinos simply find having to weigh between those two choices as too confusing that they would rather just bet on sheer luck (simulating a dart board in their brain) in the arduous nose-bleed-inducing exercise of forming English sentences on the fly. There’s so many ways to make subject-verb (SV) mistakes – oops, that should have been “There ARE…” because the subject of this inverted sentence is not “there” but “many ways”, right? Yeah, Filipinos can’t figure out the difference between 1 and more than 1. Or maybe they fell for the fake assertion which states that 1=2, the strange mathematical proof of which is found in the article Zero is Number One. But like fake news, repeat something a hundred times and it will soon sound correct. That’s why Filipinos who can’t keep up with this fundamental elementary grammatical rule yet wants (uy sorry ulit, WANT pala) to sound conio and elite end up having to mix Taglish with pure English just like how their favorite idol “fake VP” (quotes – for the benefit of the doubt) does so in her main job of offering unsolicited advice to the administration on national TV. Oh diva, with Engalog I still SOUNDS great pa rin no? Now the tricky part is finding the subject. Remember that the subject is not the object, and it can even be embedded within onion layers of ANDs and other conjunctions, adjectives and prepositional phrases. The quick and decisive military offensive that was meant to bring about both the extermination of the terrorists and the safe retrieval of their hostages ALLOWS Filipinos to welcome the coming Christmas season with renewed peace and hope of a brighter year to come. As tempting as it is to use a plural verb there, the subject in that previous sentence was actually singular (the offensive, not the BOTH clause); so the verb must also be singular (allows, instead of allow). Gets? For Real? C’mon now Philippines! Now why does SV agreement matter so much? What’s the big deal? For one, it helps train your mind to be on the alert to apply pure unadulterated logic (a.k.a., IF-THEN common sense) on the fly. Now wouldn’t that be a handy asset if you could apply this skill in every scenario and various aspects of your life – like in handling finances, relationships, and career choices? It forces you get into the habit of following rules in general as a natural way of life. We need to do things right repeatedly until it becomes second-nature to us. No wonder Filipinos fail big at following rules; we can’t even keep simple grammatical ones to start with. It makes you sound smart and responsible, even if you’re not. It would really be great to be called a Thinking Pinoy, rather than a Sinking Pinoy right? I just hope I’m not labeled a Stinking Pinoy for promoting English here, rather than the national language. I’ll tell you a secret though: another way to look smart is to simply STFU – an unsolicited counter-advice to “fake VPs and senators”. Now if you just can’t get the SVA rule, try using future or past tense in everything you say. The ball will fall. The balls will fall. The ball fell. The balls fell. That way, you can escape responsibility, the way Noynoy likes making excuses. Good luck on that though with was and were. My first article in GRP was entitled Should Filipinos Go Back to Pursuing Excellence in English? It’s kind of nice to go back to one of the subjects that I think GRP is clearly an authority on (compared with Pinoy Ako Blog). Back then, it was quite common to get discussions rolling with 200+ comments; well that was up until Mocha Uson Blog and Thinking Pinoy in Facebook while riding the cultic Duterte wave stole the show. The mere existence of an article like this should be an insult to us Filipinos and a foreboding harbinger of the dangers that LIES ahead (yeah, you should be getting a hang of it by now; catching them SV disagreements isn’t really so difficult). I’m not saying we need to be perfect. But at least, show some effort guys, even if it’s just in the comments section of Facebook. I have people around me who I simply can’t afford to directly confront on their glaring SVA issues without risking some degradation in friendship, or getting accused of being a grammar police (how mean and disrespectful of me). You know how “balat sibuyas” most Filipinos are. I am hoping they would just stumble across this anonymously-authored article and have that proverbial bulb light up inside them, thereby sparing me of having to suffer hearing/reading crooked English on a regular basis. We have fallen from such a lofty pinnacle compared with the stature of our parents and lolos/lolas who were such disciplined grammarians back then. I say this to our national “Tagalog-dubbed prime-time American show” shame. Just try reading essays by cream-of-the-crop U.P. students nowadays, and you’ll understand the “state of the flock”. Ironically, many who perpetuate this SV mishandling disease even have advanced degrees and hold titles like Engineer, Attorney, General, and Mayor to match their brilliantly sounding surnames. What will become of us Filipinos if we lose even the only remaining advantage we have in this region of the world? Note: Catholicism and Jeepney-manufacturing skills are not counted as pogi points. Hopefully, someone will not have to be forced to write an article entitle “From Third World to Fourth” in the distant future, as Myanmar zooms right past us on the next lap. A little conscious effort should do the trick. Or should Filipinos just go back to grammar school instead? Take this pop quiz to find out. Identify the sentences with fake grammar (SVA issues). Warning: beware of exceptions to the rule. 1. Three hundred pesos were all he paid for the repairs. 2. The Philippines along with the United States and France plan to vote against the resolution. 3. The butterfly species to which belongs the three specimens was discovered by the professor. 4. Adam who is an active member of his fraternity and a leader of two campus activist groups want to join national politics. 5. Precision machinery as well as electrical equipment of various types are needed to start the project. 6. Mainstream media has failed us and fake news from both political camps have infested our blog-sphere. 7. There are a boy and a girl sleeping on the couch. 8. Three bags of rice is what the organization donated for the relief operations. 9. The small nation of Trinidad and Tabago have decided to join the environmentally friendly agreement. 10. Are there anybody among the audience of students who still possess love of country above self? 11. Great are my admiration and respect for visionary leaders. 12. Human rights is not a privilege of the few; freedom and democracy is all that matters to Filipinos. 13. Research and development in advanced science and technology is mandatory for progress. 14. The statistics shows the opposite trend; so the data gathered is not reliable. 15. Who is the smartest and most reliable in the group? 16. Eliminating the drug syndicates and their source of merchandise are vital to winning the war on drugs. 17. The rich are as guilty as the poor in contributing to environmental degradation. 18. Each of the flowers on the table is unique. 19. Beyond the mountains is a pot of gold. 20. The new features of the smartphone makes it a good buy. To be fair, English is a horribly complex language, full of weird inconsistencies (“don’t ask why, just remember it!”). And it really isn’t used much in everyday life here. It’s hard to become proficient in any language if you rarely use it. On the other hand, I’m tired of seeing far worse mistakes than the ones you mention (many of which even get native speakers confused). Public notices are riddled with examples of misspelling, bad grammar, and malapropisms or poor diction. I’m speaking of documents written by those “smart” people you mention: people with law degrees and suchlike. People who can’t communicate clearly are often assessed as being unintelligent. As you said, if you’re not unintelligent, the only other plausible excuse is that you’re lazy. As a reasonably well-educated Brit, I would probably struggle to learn English if I was doing it as a second language. I follow several aviation related websites, on which the topics covered and views expressed imply a reasonable level of education, but I regularly see phrases like ‘I would of’ and ‘could care less’ used by obviously native English speakers. For me, the biggest cause of decline is the spellchecker. It does not provide the correct spelling – it confirms that a word with that spelling exists. Think of the sentence ‘ they’re going there to visit their friends’. There has been a HUGE decline in the ability of native speakers to actually communicate in English. My theory is that it’s basically the same problem Zaxx is complaining about here: laziness. People just aren’t that interested in communicating clearly, and the attitude is encouraged by an education system that fails to tell kids: no, that is wrong, and this is right. The modern approach is to let the kid write whatever he wants as long as the reader can, with enough effort, extract some garbled meaning from it. Bahala na! Even Americans, especially those from the South make the same errors. However, that’s still not an excuse for us to be complacent with these errors. You should also add that correct grammar does not equate to good sentence construction. Also, I think that making our word choices more interesting would allow us to get our points across more concisely. We should all go back to English grammar school. There are so many English grammar mistakes in the blogs; me included. We ask the readers, to be patient with us. However, we are trying to write, the correct grammatical English in our blogs. If the subject , does not agree with the predicate , in our sentences. It is okay; as long as they agree with our readers. Sometimes, we write, Taglish. Sometimes, we write crooked English. We hope everyone, to write correct grammatical English. To say Filipinos are lazy that’s why we are commiting SV mistakes often has no basis and is irrelevant. Laziness is not the cause but rather it’s because of the complexity of the English language. FYI Filipino language’s SV Agreement doesn’t work the same way with the English language. Also, exposure to the langauage counts as well. Get your facts straight. True enough, but how about bad spelling? It doesn’t take much effort to check a dictionary, does it? I’ve noticed people can’t spell in Tagalog either. I suppose there’s SOME excuse for that (similar words with slightly different spellings in local dialects). But it’s still looks a lot like laziness. Well the fact is -> there ARE many factors simultaneously contributing to the steady degradation of the Filipino’s command of the English language; I just highlighted the most fundamental root-cause one (laziness). The difference in grammatical rules between English and Filipino IS one of the lamest excuses for the current generation’s inability to master their 2nd language. How did the generation of the late strongman get to become so adept in English then? If you had only the following choices, how would you spend 2 hours of free time? Like water seeking the lowest level, Filipinos will instinctively choose the LEAST mentally challenging option. You’ll probably need a strongman with political will to reverse the current scenario. Likely, this country’s image as the GO-TO place for learning English in Asia (popular among Japanese and Koreans) will see its soon demise. Well, that’s unless an article like this gets into the hands of some legislators or school boards who will be wise enough to take action. zaxx, I’d say Filipinos really need to make up their minds if they WANT to retain English as a National language. In other words, either do it properly, or drop it. English is a useful language in that most of the world speaks it, at least to some level of fluency. Although it is a hard language to master, it’s a very good language for expressing complex ideas. The main downside of the native languages of the Philippines is that there are so many of them. Even “Tagalog” isn’t really a single language, and a surprising number of people don’t speak it or understand it well. In my opinion it also has a very clumsy syntax that makes it hard to talk about deep ideas. How can a country work together if they can’t even discuss ideas with each other? English has become a unifying language in India, and most educated Indians can read and write English better that the typical native speaker. In order for that to happen here, people would have to start taking the English language seriously as a tool for progress, instead of wasting emotional energy on debates about the “colonial legacy”. Spot on Marius… you should’ve submitted that to Benign0 as a stand-alone article. UNITY! – who even touches on that topic nowadays? Obviously, English is much more complex than Tagalog or other local dialects. And with its power and depth, it aptly serves as the tool of choice for sophisticated minds wanting to communicate complicated ideas. I don’t think PInoys can in anyway take the option of dropping English if it wants the country to excel, advance and even lead on the world stage. PH is already considered a Newly Industrialized Country (NIC); there’s no where to go but UP (no, not referring to U.P. here). It helps that we have a president and a presidential daughter now who can actually showcase a good command of the language. One way to win the debate on English vs. Taglish is through good ol’ inspiration. Then there’s the need for “practice makes perfect”: Pinoys who wish to improve can just come over to GRP for a refreshing doze of properly executed grammatically correct English and express themselves in like manner. Iron sharpens iron. So I would encourage people in the comments section to take on their grammar police badge every now and then. That way we’ll be moving up rather than putting up with the prevailing “pwede na” standard of quality we see all over the country. I’d say Filipinos have already de facto decided they don’t want to retain English. They’re just too LAZY to change whatever is “official”. Filipinos don’t want to work together. They want to insist on their own ways, and have everyone else adjust to them. THAT is their idea of unity. They on top, everyone else beneath and not complaining. Iron sharpens iron., but Filipinos simply know no other way but to make each other dull. >> Filipinos don’t want to work together. They want to insist on their own ways, and have everyone else adjust to them. Unfortunately true. Perhaps the reason this country has 200 different languages is that the average Filipino is only interested in listening to the sound of his own voice. Whether anyone else understands what he’s saying is of no interest to him. Besides, the universal palm-out “give me money” gesture is pretty universal. No words needed. And to think English would’ve been the perfect medium to bring the numerous “Filipino” tribes together. It is neutral, and does not favor any particular ethnic group (they’d all struggle equally to speak it decently). Oh sure. It means “I’m trying to figure out if you’ll fall for one of my simple-minded scams, or should I find another victim?”. Totally universal, all the way from Prishtina to Phnom Penh and back again. The greater part of the country’s troubles are due to questions of grammar. The Chinese, and their well-bribed political dynasties, are deliberately dumbing down the population, by taking money out of the public school system and passing the responsibility to the masses to send their children to private schools, with no uniformed standards for educating their students. Furthermore, these business and political oligarchs are strategically using their Chinese-owned media conglomerates (ABS-CBN/TFC and GMA), to distract the general population from reading literacy to “telebasura” stupidity, in order to maximize the potential for fleecing an already oppressed and brainwashed nation. The pro-Chinese contributers to this GRP blog need to start acknowledging these facts, and start writing and commenting along those lines, instead of laying all the blame on the obvious masses that’s already at fault. So stop “cooking-cutting” the blame; blame everyone who’s at fault if you really want to correct the problems of your country: “One fault makes it wrong. Two (or more) faults don’t make it right either,” especially if you’re only going to blame others but not yourself, on why your nation is screwed up. That’s hypocrisy and this blog is full of it. Welcome back Aeta! And here we are back to the good ol’ pro-/anti-Chinese debate again. Dumbing down the people – well that’s everyone’s fault of course (Catholic church, insurgents, DepEd, parents and even me). The bright side though is that everyone seems to be so happy. Those watching the Telenovelas, and the Chinese businessmen who practically run our consumer driven economy. I think you need to revisit your approach on the issue here though – ‘coz practically speaking, any call to make Henry Sy shut down all his Malls will never see the light of day. PS: by the way, “masses that are” may sound more SVA compliant.